The best social media strategy is the perfect marriage of content, business goals, and audience. It’s easy to be intimidated by the vast number of options when crafting your social media strategy, so we’ve put together 6 simple steps to help you build your digital brand. Your first step is to define your goals. Common goals include: product promotion, brand awareness, and customer engagement. Once your goals are defined, remember everything should map back to them—that includes the messaging of your posts. Then, think about how you plan to measure them. What are metrics will you want to use to evaluate your efforts? Clicks? Comments? Retweets or Shares? 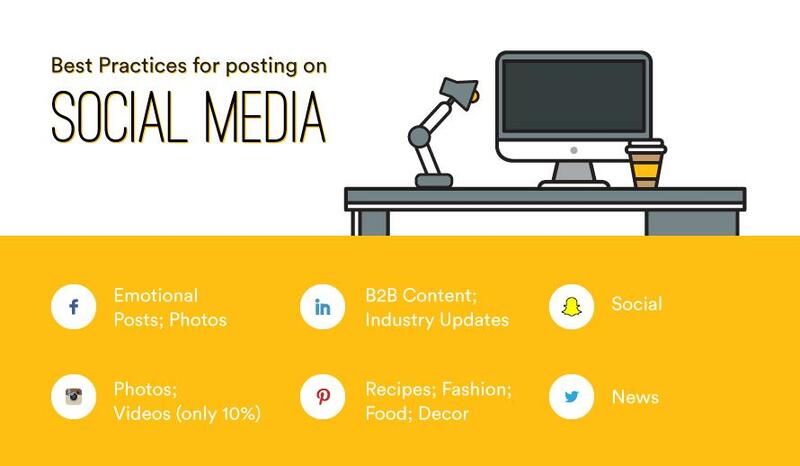 All of that should be clearly defined in your social media strategy. You might be wondering how many social media outlets you should start with. The more sites you choose, the more content you’ll be responsible for producing. It’s better to do one thing well than to do four things just OK… so make sure to focus your efforts and choose wisely so that you don’t stretch yourself too thin. As you’re choosing the best social media outlets for your business, keep in mind that each channel requires different types of content. The content format of some channels might be more of a natural fit for your business. For example, some retailers have experienced a boost in sales by posting their product pictures on Pinterest. You should also do some market research to identify which social networks are most commonly used by your target audience. Don’t make the mistake of posting the same exact content with the same exact messaging on all of your social media outlets. Each of your social media networks is likely to have a different target audience, and therefore different content will appeal. Diversify the type of content you’re developing. According to Quick Sprout, some common, popular content types include memes, videos, guides, how to’s, lists and research-based data. Your audience will respond to different content shared on Facebook than on Instagram. Facebook studies show higher engagement with an emotional story, which includes a compelling image to connect the reader to the post—whereas LinkedIn has higher engagement rates on B2B content with a link to the post. This chart shows which types of content drive the most engagement on each outlet. Now that you know what content to create, an editorial calendar can help you manage your content production process. An editorial calendar can be an asset for your social media sites, as well as for your blog. It’ll tell you what to post and keep you on track with a balanced array of posts. Post to LinkedIn once per day (or at least 20 times per month). Sharing and following tools can help you target your audience and keep track of relevant buzz around your business and trends. AddThis Sharing Buttons is a great way to enable sharing which helps to drive traffic to your site by enabling users to share your blog posts on social media. Social media listening tools can also be useful. Hashtagify.me allows you to follow trending hashtags related to a topic of your choice. You’re doing all this work, but if you’re not checking to make sure it’s effective it’s of no use. This means you need to monitor analytics on your posts. Clicks, shares, retweets, likes, and comments are all important measurements of engagement. The AddThis Analytics dashboard helps give insight into how people are sharing and consuming your content. addthis.com original source - Thanks for this great article!